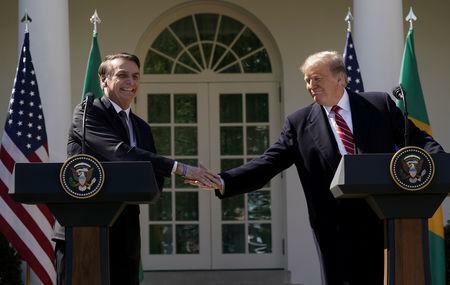 WASHINGTON/BRASILIA (Reuters) - Brazil's right-wing President Jair Bolsonaro won glowing praise and conditional promises from U.S. President Donald Trump on his visit to the White House this week, yet Brazilian negotiators came away grumbling about their hosts driving a hard bargain. Bolsonaro, an outspoken Trump admirer who seemed eager to please at their first meeting, failed to win more room for Brazil's sugar exports or overturn a U.S. ban on fresh Brazilian beef - both major objectives of the country's farm sector. "If this is the way forward, we might as well stay put," said a Brazilian official directly involved in the negotiations, who requested anonymity to speak freely. "They asked for everything, but didn't want to cede on anything." Bolsonaro celebrated his visit as the start of a new era of U.S.-Brazil friendship, playing up his admiration of Trump and their shared disdain for political correctness and "fake news," as they often call unfavorable press coverage. The presidents also found common ground in condemning Venezuelan President Nicolas Maduro and cooperating on public security and military development. Designating Brazil a "major non-NATO ally" will ease U.S. arms sales to the Brazilian armed forces, while a new technology safeguard agreement will help U.S. companies to conduct commercial space launches in Brazil. However, in more transactional areas such as trade, the Brazilians' goodwill offerings, such as an annual import quota of 750,000 tonnes of tariff-free wheat, were not met in kind. 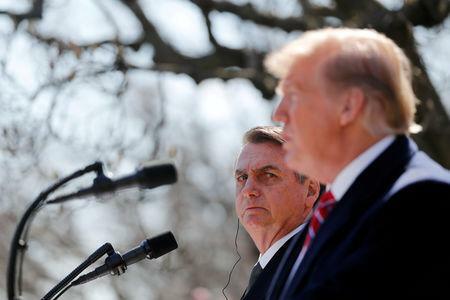 "If this reciprocity does not occur, Bolsonaro's preference for the U.S. will look naive in the future," said Welber Barral, a former Brazilian foreign trade secretary. Brazil's new openness to wheat imports will mainly benefit U.S. exporters and was a slap in the face to neighboring Argentina, another major trade partner, Barral said. He also warned that Brazil stands to face more setbacks on trade if it gives up the benefits of "developing country" status at the World Trade Organization (WTO) — the U.S. condition for supporting Brazil's bid to join the Organisation for Economic Cooperation and Development (OECD), a policy forum for wealthier nations. "That's no exchange. He's making that demand," he told journalists. "You want to sell pork? Okay, buy my beef. You want to sell ethanol? Buy my sugar. Beef for pork, ethanol for sugar, wheat for auto parts. They're little things," he said. Guedes reminded the audience that China, Brazil's top trading partner, would be ready to pick up the slack if the United States did not engage. "They are moving in, trying to invest," Guedes warned.